What time is it really? When or where in time are we? Are we at the beginning (how long is human memory?) or are we nearing the end? (How far into the future can you see?) It all depends on what you count, when you start counting and what tools you use for measuring. In principle, the frequency of a Cesium-powered atomic clock, or a pulsar, or a planetary movement, or a pendulum, or a crude chip in the rock to mark the position of the sun and the moon at the horizon, are all tools that measure time in a dimension of space. Space, or better, its distance, is defined by time, because we define the meter by the amount of time that light needs to travel a certain distance. Defining time in space is an age-old human tradition, well-delivered by many myths. Confused yet? Don't be. Telling time the old-fashioned way is easier and cheaper than using clocks set to the period of decay of a Cesium atom, because all you have to do is look up. In any linear or cyclical measurement of time, there must be orientation to some point, to begin a count, forwards or backwards: either at a beginning, a world creation event, whether of the universe itself or the founding of a great city or regime; or at an end, like the end of a long calendrical period or a fictitious end of the world. This is the true time frame of every historical narrative, which fix their points on mythic events, like navigators take a bearing on distant mountain peaks. Early Christian chronology used mythical events like the creation of the world to begin time. For example, the fictitious beginning of the Anno Mundi count that is pegged to a biblical creation assumed to take place 5500 years before the assumed appearance of Christ. "I live here and now", you may say and you are right. But how can you define now? Time is fleeting and so is now. Or as the saying goes: Today is yesterday's tomorrow. And if you only have a now, you would have no past and no future, no history and no hopes. So, who cares about the start of an Aquarian age? Why should we have any interest in when it starts? Why not just avoid the question? In any period of great changes, especially when there are dramatic events, the turn of centuries, and a millennium change, mankind asks the legitimate question of how to find orientation in the ages of the world. The basics are easily apprehended by anyone having a brief familiarity with the night sky and Western civilization. The Austrian astronomer, Professor Hermann Haupt, examined the question of when the Age of Aquarius begins in an article published in 1992 by the Austrian Academy of Science: with the German title Der Beginn des Wassermannzeitalters, eine astronomische Frage? (The Start of the Aquarian Age, an Astronomical Question?) Haupt's thoughtful study offers an opportunity to discuss this matter. At the beginning, Haupt quotes the Lexikon der Astrologie (Becker, 1981) with its astrological view of history, in which each Platonic month, i.e. each world age, lasts 2150 years. He also quotes Rosenberg (1958), who said the age of Aries (2200 - 150 BCE) is related to the Old Testament; the age of Pisces (150 BCE - 1950 CE) is linked to the New Testament; and the age of Aquarius (1950 - 4000 CE) is linked to the Holy Spirit. The Platonic Year is both a scientific finding and a mirror of myth. The existence of that year is marked out by the constellations. Thus both are expressions of human visions. Historical science tries to find by induction in numerous events the connection of cause and effect. The myth, however, starts from a view of the whole and tries to collect, order, and interpret singular events of life by deduction. Myth and history don't exclude each other; rather, they complement each other. As the yearly count shows, they need each other, because all recent historians use the AD count, which is based on completely mythical events. Definitive for the Platonic ages or month is the duration, 25,800 years, in which the point of spring equinox moves along the constellations of the whole zodiac. If you divide the Platonic year by 12, the result is the often-told number of years of the world month (25800 / 12 = 2150). This value, however, is only an average. Because the constellations are different sizes, the shifting along the zodiac takes different amounts of time for each one. Haupt clarifies, absolutely correctly, the reason the world ages cannot be the zodiacal signs, which are shifted during a Platonic month with the point of the spring equinox, due to the precession along all constellations on the ecliptic. The point of spring equinox never shifts through another sign, but is always at 0° of the sign Aries. This point, however,shifts slowly through one constellation after another. Any further discussion is useless if the difference between constellations and zodiacal signs and the history of their origins is not well understood. We don't know when the constellations were formed, because this might have been many millennia ago, but we know about the designation of the signs. Haupt briefly mentions the origins of the constellations, their definitions, and their borders. He states that the constellations originated with the lines linking the brightest stars, out of which human fantasy created characters, but which were formerly not separated by borders from the neighboring constellations. Some time ago, after long and intricate discussions, astronomers decided that defined borders for the constellations were necessary, and in 1928, at the Conference of the International Astronomical Union (IAU) in Leiden, the Netherlands, the borders of the constellations were decided, mostly as Delporte has computed. These boundaries lie along the hourly and parallel cycles of the equinox of 1875 (Delporte, 1930). "Though it cannot be expected that astrologers will follow the official boundaries of the constellations, there will be an attempt to calculate the entry of the spring equinox point into the constellation of Aquarius." Using the usual formula of precession (Gliese, 1982) Haupt's result is the year 2595. Finally Haupt mentions some astrological data for the beginning of the Aquarian age and quotes their suggested years: 1950, 1997, 2154 (C.G. Jung) and 1950, 2158, 2469 (Rosenberg). 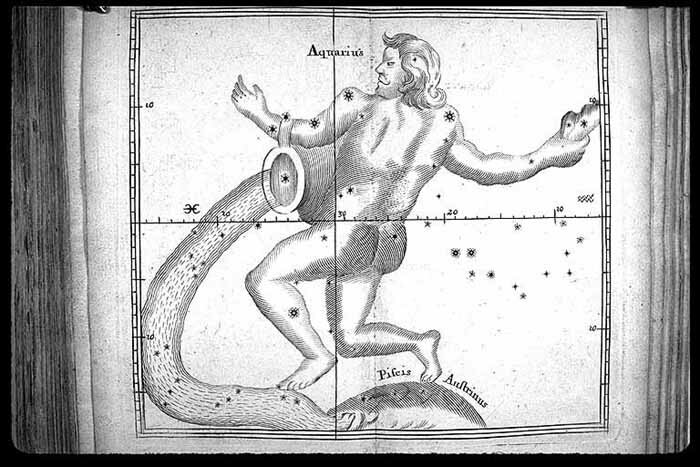 "As briefly has been shown, the results and methods of astrology in many areas, such as concerning the Aquarian age, are controversial on their own and cannot be called scientific because of the many esoteric elements." Haupt's reproach to astrologers, who are mostly ignorant of astronomy and star knowledge and are only interested in horoscopes and character or psychological astrology, is completely correct. But unfortunately, Haupt overlooks in his reckoning of the beginning of the Aquarian Age a fundamental base that evolved from a very old human tradition. The idea of zodiacal signs arose first about 2700 years ago in Babylonian astronomy, which first divided the 360° of the ecliptic into 12 equal parts of 30° each and gave them the names of the constellations in the same part of the sky. 2. The stars, their images, as the stars of the zodiac, he fixed. 4. For the 12 months he fixed three stars. 7. That none might err or go astray. 8. He set the station of Bel and Ea along with him. Nibir was the special name of the planet Jupiter when on the meridian; Merodach (Marduk), as the deity of that planet, is represented as pacing out the bounds of the zodiacal signs by his movement during the course of the year. Jupiter needs about one year for each sign (30°). Because for about one-third of the year Jupiter appears retrograde, moving from East to West about 10°, Jupiter thus divides each sign into three equal parts. Thus the planet marks out any third part of a sign with one decan, resulting in 36 decans in the whole zodiac. In the third line, mizrata, cognate with the Hebrew Mazzaroth, means the divisions or sections of the year, corresponding to the signs of the zodiac or the 12 months. Please compare this with Job 38:31-33: "Can you bind the chains of the Pleiades, or loose the cords of Orion? Can you lead forth the Mazzaroth (the zodiac or the 12 signs) in their season, or can you guide the Bear with its children? Do you know the ordinances of the heavens? Can you establish their rule on the earth? In this connection, the Arabic word Al manazil, i.e. the mansions or houses of the moon and the Hebrew Mazzaloth (2 Kings 23:5), where Josiah put down the idolatrous priests who burned incense unto Baal, to the sun and the moons, to the planets (omni militiae caeli) and the 12 signs (duodecim signis or Mazzaloth). The beginning of the signs originally were not linked with the point of the spring equinox, as Kugler, van der Waerden, and Neugebauer showed, but were linked with remarkable, bright stars of the constellations. A star catalogue of this time gives us a proof of this, because it gives the lengths of some stars in relation to the beginning of the signs (Sachs, 1952). As P. Huber shows, due to the star positions about 100 BCE, the point of spring equinox was 4°28' +/- 20' away from the beginning of the sign Aries in the Babylonian system (Huber, 1958). Using the Babylonian star catalogue, we can draw a star map with these stars and the presumed Babylonian signs and cardinal points of about 150 BCE. Image 1: The positions of the borders of the Babylonian zodiacal signs Taurus, Gemini, Cancer, Leo and Virgo at about 150 BCE. Image 2: The positions of the borders of the Babylonian zodiacal signs Libra, Scorpio, Sagittarius and Capricorn at about 150 BCE. Aquarius, Pisces, Aries and Taurus at about 150 BCE. This division and positioning of the zodiac was used without change until the era of Seleukos. According to the Roman architect Marcus Vitruvius Pollio, who wrote 2000 years ago, in his Book IX de Architectura, the sun arrives at the points of the equinoxes and solstices after 8° (which corresponds to 7° in our way of counting, because Vitruvius used no zero) in Aries, Cancer; Libra, and Capricorn. This value would give different boundaries of the zodiacal signs than the Babylonians, but it shows also that in former times the signs were not linked to the starting points of the equinoxes and solstices. One reason that the start of the sign is 7° before the equinoxes could be that Vitruvius owes his knowledge to Berossos and the Chaldeans, whom he often quotes in his book. Since Ptolemy, the beginning of the signs, i.e. point of Aries, has been identified with the point of the spring equinox at the intersection of ecliptic and equator. Therefore, it is not principally wrong if someone says the vernal point moves along the signs, so far as it explicitly concerns the Babylonian zodiacal sign system. It is doubtful that modern astrologers and horoscope forecasters have this knowledge. Generally, they rely on the recent ephemeredes for their calculations and predictions. As many testimonials of ancient astronomy show, the first morning visibility of a star or constellation, i.e. the heliacal rising, was the most important observation used for temporal orientation. As an example, the mulAPIN, a Babylonian star catalogue, records the heliacal rising of the most important 36 fixed stars, which were predecessors of the 36 decans. These 36 decans are found on many Egyptian sarcophagi, such as the Cenotaph of Seti I, as well as the famous zodiac of Dendera. The decans were situated south of the ecliptic. Each star had 10 days assigned for use in timekeeping. Each three of these decans were assigned to the constellation that was first upon the horizon, rising in the path of the sun. Out of this originated the divisions of the signs of the zodiac (van der Waerden, 1965). The arbitrary point in this tradition of stargazing was when the first visibility of a star or constellation occurred, because this was the most important judgment for timekeeping and in former times often was linked with destiny and fate. This age-old tradition is completely ignored by Haupt, who calculates the movement of the spring equinox point across the arbitrary boundaries drawn 70 years ago between Pisces and Aquarius. This boundary also might have been drawn 4° North along the recent heavenly equator, which would end any discussion and the Aquarian Age would start right now, even by Haupt's calculations. How and with which methods this start of the age could be estimated or ascertained also shows its dimension in cultural history, which largely has been ignored. However, the change of an age also focuses on religious aspects, which we might demonstrate with the star of Bethlehem or believers looking forward to the return of the Lord at the millennium. Therefore it is necessary to take a different approach to this theme. In addition to the purely modern astronomical view, we need calendrical, archeoastronomical, and several other points of view, because this question can be answered only by using an interdisciplinary approach. If the start of any world age, era, or epoch is considered from different points of view, the result is not necessarily more accurate, but it may be more understandable and transparent. If the start of any world age, era, or epoch is considered from different points of view, different arbitrators are required. The new age begins when the point of the northern spring equinox (NSE) enters the boundary of a new constellation (currently Aquarius). The point of intersection on the ecliptic (pathway of Sun) and heaven's equator, the point of Aries or NSE, is specific and can be defined easily and exactly by a formula that uses average celestial movements. The exact moment that the sun enters the boundaries of the constellation Aquarius at the NSE can be determined precisely very hardly, because the Earth, from which the sun is observed, does not move uniformly due to the gravitational pull of the moon. Earth moves not uniformly, but faster or slower in its orbit, depending on whether the moon is waxing or waning. The difference of the year's length between the equinoxes can be 16 minutes. In 16 minutes, however, the sun travels along the ecliptic about the same distance (0°.011) as the vernal equinox shifts annually (0°.013). Therefore, the actual entry of the sun's center at vernal equinox into the next constellation may be delayed for one year and also depends on the moon's position. This is not taken into account in the usual calculation of the precession, which is based on the length of an average year. The sun's entrance into the borders of the constellation of Aquarius should be watched like a referee watches the ball at a football game. A new question arises: What is the specific moment of the Sun's entry into the new constellation? Are the conditions fulfilled if the middle of the sun enters the border, or only the edge, or the whole disc? This consideration alone causes problems, with a difference of about 37 years for the beginning of the age. Briefly, due to the average movement of precession, the vernal equinox needs 71.66 years to move 1°. Therefore it needs about 37 years to move one-half degree, which is the diameter of the sun's disc. As shown, there can be calculated an average value of the entry over the constellation boundaries, but this represent only the mean amount, because an exact date would need new definitions and extremely exact measurements, which results in absurdity. Additionally, the results of the 1928 IAU conference, which established the borders of the constellations in the sky atlas, are the most important criteria for this decision, which surely was not the intention of this conference. No honest astronomer could have decided this question conscientiously or would have agreed to this decision. But what court could decide such a case? The drawing of the boundaries in 1928 would have some strange consequences if one used them, not only in the future, but proleptic for the calculation of the beginnings of past ages: At about 100 BCE, the spring equinox sun first would have entered the constellation Pisces, but would have left it briefly about 1600 CE, moving towards Cetus (whale) for some years, and then returning into Pisces, where it would have stayed until about 2500 CE. 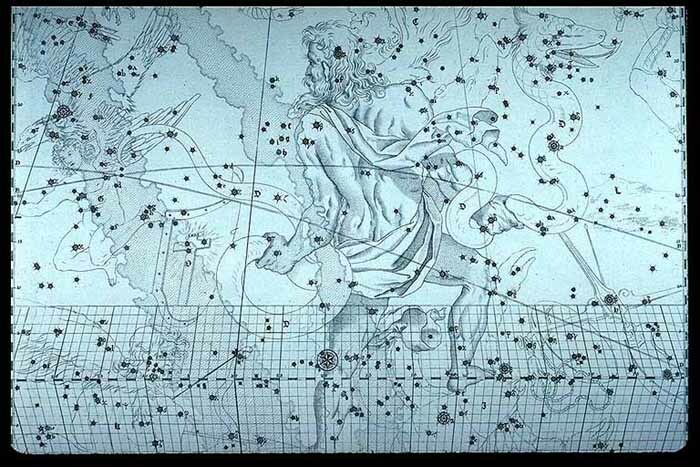 Image 5: Boundaries between the constellations Pisces - Cetus at about 1600 CE. Even more of a paradox is the shift from Taurus into Aries, if one uses the recently adjusted boundaries as the benchmark. Because of the boundaries, the spring equinox sun, after being in Taurus since 4550 BC, would have entered Aries first around 2000 BC. The sun would have exited Aries, moving toward Taurus, and then would have re-enteredAries in about 1800 BCE. The arbitrarily drawn zigzag boundaries may have been useful for some astronomers, but they are illogical, similar to some of today's terrestrial political boundaries. The next critical point for these constellation boundaries is the southwestern area of Pisces, which enters the lines between the Aquarian stars in some star maps. That problem would have been avoided if the boundaries had been drawn more northerly. This would cause an earlier start of the Aquarian Age, as calculated by Haupt's method. You don't need to be a great prophet to predict no eternal life for these boundaries, because due to precession, they shift farther and farther away from the vertical position of the heavenly equator of 1875. A new constellation rising on the eastern horizon before sunrise on the morning of the NSE replaced in this position the former constellation, due to precession. Recently, Aquarius replaced Pisces, and the stars of Pisces are no longer visible in the dawn of NSE. Simultaneously, in the west, the opposite constellation has risen upon the horizon, which occurred 2000 years ago with Virgo and led to the use of terms like era from the observation of its main star Spica, the wheat ear (Greek: era). Now, in the west, the constellation of Leo has moved to the horizon of the spring equinox morning and has replaced Virgo. Precession, however, is a very slow movement; in 71.66 years the constellations shift only 1° in relation to the point of spring equinox. The occurrence of a new spring constellation in former times led to increased observance and interpretation of celestial events. If a new NSE constellation announced the rosy dawn of the vernal equinox sun, it was time to expect a very salient heavenly event, which could be interpreted as a portentous symbol of the celestial gods. 2 a) On the one hand there might be a triple alignment of Jupiter and Saturn, seen in Greek mythology as a struggle between the gods for supremacy in the new constellation and age. This occurred at the Conjunction of the Arab people 571 CE; Star of Bethlehem 7 BC; Triple Conjunction at the foundation of Persepolis 523 BC; Triple Conjunction in Aries 1536 BC (possible birth of Moses? ); and the mythical race of Zeus and Chronos that was mirrored by the race of King Oenomaus and Pelops, the mythical base of the ancient Olympic games. This occurred at the Kali Yuga 3102 BCE; Zhuanxu 1953 BCE; the alignment of May 2000 that Dionysius picked and used for adjustment of AD; mythical Olympic symposium; and so on. Because of precession, on a recent morning of the spring equinox, no stars of the constellation Pisces were visible. Aquarius had replaced Pisces as herald of the first day of spring. Also, in the West the constellation of Leo rose upon the horizon and increased the expectation for a new precessional age. In the traditional view, the year 2000 is a Greatest Year, because on 5th May, 2000, an alignment of all classical planets took place. In antiquity, there were several other celestial events that left unforgettable impressions in human history and were used for temporal orientation as a past event or future expectation. It is recorded by Herodotus (I 74) that as early as 2500 years ago, scientifically precalculated eclipses were decisive in ending wars: "As the war was still unsettled after six years, this event took place: during the battle, suddenly day became night. Thales of Milet predicted this change of daylight to the Ionians." Xenophanes considered the prediction of Thales (Diogenes Laertios I 23), which brought for the prepared Greek Ionians a decisive advantage against the Medeans. Modern computer programs prove this eclipse took place on 28 May 585 BCE (van der Waerden, 1965). The prescientific star knowledge is mostly delivered by myths, and here we enter a broad area of speculation and interpretation. That this myth represents the previous state of science in a lost language is often arrogantly overlooked. We call the recent mythology science, Anthony Aveni says in his book, Dialog with the Stars. along the path of the mother. German archeoastronomer Ralf Koneckis showed that this is a pictorial description of a solar eclipse, which he connects with one that took place on New Years Day 865 CE (Koneckis, 1994). similar to the previous one. A new sun rises in the floods, now wolf threatens no longer the creation, because Widar, the silent son of Odin, has killed the Fenris wolf with a kick of his foot and took revenge for his father. There is even an assumption that the base of the fairy tale Red Riding Hood is a solar eclipse. The Edda also links the end of the world with an eclipse as Völuspa 57 reads: "Sol ter sortna …" (the sun is becoming black). Similar are the words of John of Patmos, which foretells the end time: and the sun became black as sackcloth, the full moon became like blood (Rev 6:12). Also the Gospel tells of darkness that fell at the death of Jesus on the cross from the sixth until the ninth hour. This. like a lot of reports, is literally a religious vision, because at the time in question, no eclipse took place. In addition, a total eclipse cannot last three hours. A lunar eclipse that took place at the time of King Herod the Great reveals as false testimony the Christian yearly count or the Gospel: The date of Herod's death can be reconstructed quite precisely because of a lunar eclipse. In the last months of the sick king, Jewish fanatics, led by the Pharisee Matthias, damaged the golden eagle at the gate of temple. The zealots atoned for their audacity by being burned at the stake on a night when a lunar eclipse occurred, which must be the one of 15-16 Sept. 5 BCE. Soon after this, Herod died, and his funeral took place shortly before Passover (Pesach) 4 BCE. Because the Gospel of Matthew deals with the report of the magis, one of the stories must be untrue: the Gospel or the yearly count (which begins at the supposed incarnation of Christ). Another story of a lunar eclipse is the fairy tale of the race of Hare and Hedgehog. The Hedgehog wins the race after the 73rd run, when blood gushed out of the moon/hare's neck and he dropped dead. Presumably, this myth expresses in Nordic cultures the shift of lunar calendars to solar calendars in a pictorial way. Comets also play an important role in starlore, and they have had massive effects on the history of Earth, as recent examples show: Comet Shoemaker-Levi 9 had a collision with planet Jupiter on 16th – 22nd July 1994. On 30th June 1908 there was an impact by a celestial body in the Siberian Tunguska area. Presumably this was not a comet, but a meteorite. The 100m diameter body exploded about 6 – 8 km in the air above Earth and damaged the surrounding area for 30 km, knocking down and burning all trees in the unsettled wilderness area. Comets also left their trace in the arts: The famous Renaissance painter Giotto about 1300 CE painted the impressive fresco of Christ's birth in the Scovegni chapel of Padova, Italy. There he depicted the star of Bethlehem as a comet, because Giotto himself had seen Halley's comet as it came near the Earth on one of its 74-year orbits. This representation was copied until recent times and led to incorrect imaginations of the event that is at the base of the star of the magis. Even in early astrology we find reports of comets. After the death of Caesar, a comet appeared that people called "sidum Julium" (star of Caesar), viewing it as positive proof that the emperor had been accepted as one of the globe ruling stars. Therefore, in Shakespeare's play, Julius Caesar, Caesar's wife, Calpurnia, says: When beggars die, there are no comets seen; The heavens themselves blaze forth the death of princes. On the night of 6 April 1997, the 1001th night before the year 2000, the comet Hale Bopp appeared, and Allen Ginsberg, died. He was the poet and prophet of the beat generation, which eventually found its expression in the hippie and peace movements. Let us not forget that because of Comet Hale Bopp several members of end-of-the-world sects committed suicide, presumably assuming they would avoid a more horrible end. History is delivered by story telling, therefore literature has a great influence. An epoch (from Greek: epoch, stop for a moment) in modern astronomy is a point in time or precise date for planetary or stellar positions, such as in a 2000 ephemeredes, where 2000 represents the epoch. In literature and art, an epoch is expressed by the cultural feeling of the people at a time when some very remarkable event took place that was impressed deeply in their minds and was expressed in music, art, or other cultural ways. In the epos (myths, fairy tales, religion) people remember their myths by celebrating religious feasts or holidays ("holy days") and counting time from an event (such as a jubilee). In the past, these myths were expressed by the Old and New Testaments, Greek tales of the gods and goddesses, Northern fairy stories, Hindu and Buddhist legends, and uncountable treasures of the human arts of storytelling and literature. For example, the Christian symbol ICHTHYS was linked to the Northern Spring Equinox, once observed on 25 March. Today, the feast of incarnation (annunciation of St. Mary), is celebrated at the former day of vernal equinox, 25th March, which was NSE in the Julian calendar 2000 years ago. Even older sources based on the Persian myth of Shanameh, describe the hero's birth as being celebrated at Nauroz (new day). The traditional Persian calendar still celebrates the day of vernal equinox, of which the myth says: "Don't slumber any longer! Throw off sweet sleep and think on the times that are coming, because from now on all is changing. There will be new feast days and new customs will replace the old ones, because tonight is born Shah Kai Chosrau!" At his coronation, Shah Kai Chosrau said: "The whole world is my empire. Mine is everything, from the fishes to the head of the bull!" These words clearly express what he means, because between Taurus and Pisces is nothing less than Aries and its age. Also the Jewish feast Passover (Pesach) reminds us of the precessional shift from Taurus to Aries, when during the exodus the Israelite tribes sacrificed to the golden calf. Because Moses destroyed the tablets of the 10 commandments as a result, he is often being depicted in artworks with horns of a ram. Arts: stage production Hair with its song "Aquarius," Rocky Horror Picture Show film with the song "Time Warp." Science: moon landing, internet, cloning, atomic power. Politics: peace movement, generation X, terror, holocaust and ethnic cleansing. The term "age" contains the question of the age of the world. At the end of antiquity, dubious religious-based chronologies existed that were founded on biblical cosmologies, from which was created the Bible-based Anno Mundi (age of the world from creation) chronology. In general, one could say a new age leads to a new calendar and starts a new era with a new way of timekeeping. 4 a) The term "Calendar" comes from Kalendae, the first day of the month solemnly announced by Roman priests, whose chief was the pontifex (builder of a bridge), a title borrowed by the pope from the pagan Romans. The calendar became the mightiest instrument to synchronize, socialize, and give time orientation to people, but also to rule and manipulate them. 4 b) The term "era" comes from the Greek word "era" (wheat ear). The star Spica in ancient Greek also had the name "era." Era/Spica is the wheat ear, which the virgin in the constellation Virgo holds in her hand. With Era/Spica, the Greek astronomer Hipparchos and later Ptolemy measured the precession of Earth's axis and estimated its value at 100 years each 1°. The Roman/Latin name of Spica/era was "arista." From "born in the new era" or "born in the constellation Virgo" (which had risen because of wobble at the western sky on the NSE) came the word "aristocratic" that expressed the zeitgeist of the new age 2000 years ago. Aristocracy, virgin birth, and finally, the dogma of immaculate conception were expressions of that worldview. German words like "Ehre" (honor, from hour, Horus) derive from this! 4 c) The Greek word for Pisces, the new eastern NSE constellation, ICHTHYS, became the new religious symbol and paradigm and is still found as the abbreviationIHS in many churches. In Christian belief, the Old Testament (with many links to Aries) was valid until the appearance of Jesus, and at that time it was replaced by the New Testament. 4 d) New Age is derived from aging (becoming older) and Latin ago (acting). Thus it describes a new way of behavior as well. In the New Age, according to this worldview, the former (old) paradigm is no longer valid and new rules are pursued. The Age of Aquarius, the Waterbearer, is an expression of the time when this constellation announces the morning of the spring equinox. A new age and its calendar can be brought about by political power, as it was during the French revolution or in Islam. Whether this will take place in the age of Aquarius, time will show. For the Gregorian calendar, politics could become a problem, because suggestions for a new calendar are being made continually. Atheists and believers of other religions might not accept a Christian religious calendar in which the yearly count is defined incorrectly. Based on the Julian and Gregorian calendars, the Piscean age has come to its end, due to the adjustment of its yearly count that predicated the Greatest Year at the end of the world, or at least the end of the age, in 2000, when there was an alignment of all naked-eye visible planets. This happened because the year 1 AD was defined by the precession value of 66.6 y/1°. Due to the leap rule of the Gregorian calendar, the point of spring equinox will shift, similar to the Julian calendar, away from the Nicean date of 21 March, which was proclaimed by the papal bull "inter gravissimas" at the Gregorian calendar reform. Therefore this reform would need to be updated and changed, but this is impossible for the Catholic Church, because the bull says explicitly that: "that the same order of intermittent bissextile intercalations …will be preserved in perpetuity" (Gregory XIII, 1581). A new age will come to be if a new way of counting time is invented and put into use. Many new ways of counting time have been invented, and their creators are eagerly waiting to introduce them. The countdown to 2000 must be seen as a new calendar, worldwide in use, but one that ended 1-1-2000. The common practice of dropping the millennium digit and writing the date as 1 Jan. 02 can be seen as slowly leaving the former time orientation, because a new starting point, a new epoch, has been created, though the calendar itself is still the same. The incorrect astrological view, which views the entry of the vernal point into a new zodiacal sign as arbitrary, is the result of inaccurate reasoning. As mentioned in the introduction, the vernal equinox remains forever at 0° in the sign Aries and therefore can never enter into another sign. It would be correct to say that the Aquarian age starts when the point of vernal equinox has moved from its position in, let us say 150 BCE, to that position where in 150 BCE the sign Aquarius ended at the boundaries of the sign Pisces. It is curious that a large number of astrologers dated the start of the Piscean age at 150 BC. According to the assumption that the zodiac is divided into 12 equal parts of each 30° and according to the modern value of precession 71.66 y/1° one age would last 2150 years, and the Piscean Age would have ended in 2000. If this calculation is done correctly, and made in relation to the constellation and not the signs, there is a new question: Is the assumption correct that due to the entry into a new constellation, the status of the world or of human conditions will change? Isn't it actually the opposite? Religious literature uses rare celestial events to give their writings more value and weight, e.g., the report of the magis in the Gospel of Matthew concerning the star of Bethlehem. In the history of astrology and chronology the alignments of Jupiter and Saturn always received special attention. Because Saturn takes about 29.5 years for one orbit and Jupiter almost 12 years, both planets meet on average every 19.84 years to form an alignment that is eight signs away from their previous one. After three conjunction (after approximately 59 1/2 years) it recurs at almost the same place on the ecliptic, forming with the zodiacal positions of the other a triangle, called the Grand Trine. Each third conjunction, or edge of the Grand Trine, is shifted approx. 7° 16' after 59.5 years, which results in the Grand Trine moving through a whole zodiacal sign after 238 or 258 years. This shift of the Grand Trine was observed and calculated precisely in ancient and medieval time. For example, in the 6th century, Aryabhata indicates there were 18,138 conjunctions during a 360,000-year period (360,000: 18138 = 19.8478). Similar values are found in the Babylonian planet lists. In Greek and Arabic astronomy the shift of the Grand Trine into a new trinity was seen as being responsible for changing of the times. Even Kepler regarded it as important and also as the star of Bethlehem. The division into the four elements goes back in principle to the ancient Greeks. Anaxagoras and Democritus tried to deduce time and cosmos from the elements Fire and Water and Earth and Air, which was regarded by Plato's pupils as chaotic and heretic. For this idea the two were threatened with loss of property and death. Is this really remarkable and reasonable? A change in conditions after entering into a new age could result from a greater consciousness of human activities, similar to a company that prepares a balance sheet at the end of the year and changes its strategy accordingly. A critical review, such as that of Haupt, made on a basis of astrological history, is justified, but at the same time must be questioned: What is the base that recent history uses to date events and what is the foundation of this calendar? It appears that the adjustment of the Gregorian calendar, as well as the Julian Days, is based on pure astrology and magic symbols. Whoever rejects an astrological view of history consequently must also reject the Gregorian calendar, otherwise he would date his history on a foundation of astrology. While acknowledging the zero point of the zodiac to be defined as the point where the true galactic equator crosses the ecliptic between Taurus and Gemini, and recognizing the J2000 galactic equator defined by the galactic north pole of 12h 51.4m, 27° 8' to be representative of the B1950 definition of the galactic coordinate system, by virtue of Sagittarius A* being recognized as the dynamical center of the galaxy with the true galactic equator passing through Sagittarius A*, and by virtue of the sun being at 90° 00' 32" past the point of the crossing of the J2000 galactic equator and the ecliptic at the spring equinox of 20 March 2000, 0735 GMT, we declare the Age of Aquarius to have unequivocally arrived. Expressed in simpler terms, this declaration tells us that the point of the spring equinox (once located between the constellations Gemini and Taurus on the galactic equator) already has moved more than 90° from this point, which is exactly opposite the center of our galaxy, where there is supposed to be a black hole. The 90° relates to the average lengths of three constellations, each about 30°, and therefore the constellation Aquarius enters the spring equinox dawn, and the new age arrives. The remarkable new point of this declaration is that it is oriented at the opposite of the center of Milky Way, the white band that runs along the constellations Gemini and Taurus. The Milky Way stretches out farther along the Northern celestial dome at Cassiopeia and Cygnus (Swan) and crosses the ecliptic again near the galactic center between Scorpio and Sagittarius towards the southern celestial hemisphere. Using the position of the Milky Way for temporal orientation also has a long tradition. We need to remember here that the Milky Way represents the home of dead souls in many global myths. (See website: Santa and stars of Revelation). The constellation Taurus announced the day of spring equinox about 6000 years ago and was the symbol of the earliest European and Middle Eastern cultures. At the beginning of the Minoan culture, the equinoctial sun was located at a cross-point of two celestial paths: the intersection of the Milky Way with the ecliptic, the path of the sun, and the planets. In former times, it was a frequent custom to relate important political events to the positions of celestial bodies. This led to the use of horoscopes, which in modern times have often proved to be important resources for dating historical events. This view expresses the human wish to find identity within the framework of time measured by celestial events. The celestial motions can be used directly for temporal dating without using any calendar. The position of the planets at a certain moment never repeats exactly, but only similarly and only within some rather broad tolerances. Every planetary position at a defined moment is a unique event. Expressed another way: In any random moment of time, the planets arrive at a certain unique position, never to be duplicated. Mankind measures time using the stars. Lay people, whose knowledge is based on belief, rather than science, say: "The course of the stars determines time," and from this, religious people derive the saying that "Heaven guides everything on Earth." (Boll, 1903). If you look at these words, you may notice immediately the error of easily led religious people. They are not allowed to form independent, alternate conclusions and therefore hold erroneous expectations and worldviews. Here must be mentioned all the imaginable possibilities for faking history. The suggestion by German historian Heribert Illig that there are 300 phantom years of medieval time must be addressed (Illig, 1997). This thesis, however, can be contradicted by the witness of the celestial movements, of which there are enough exact and redundant ancient reports to calculate backwards the temporal courses by using modern computer programs. The opportunity provided by astrochronological dating of history is hardly used at all, but could contribute to the enrichment of human timekeeping. The beginning of the Aquarian age, due to precession, depends on the one hand on the bounds of the constellations and on the other hand on the approach to it. If the horizon of NSE and the unaided eye establish the boundary between the pictorial characters of the Waterbearer and the Fish, then the new age begins. If you take as decisive the boundaries of the constellations, as drawn in 1928 by IAU, the beginning will be in about 600 years. In 2000, an anciently defined, remarkable point in time was reached, which, in the ancient worldview and due to the adjustment of the Christian yearly count, can be seen as the turn of the age. Although the alignment of May 2000 marks the end of the Piscean age, according to the yearly count of the Christian Era, it need not mark the beginning of the Aquarian age. The yearly count of the Julian and Gregorian calendars was based on the false premise that the constant of precession was 66.6y/1°. The alignment of May 2000 does not fulfill the ancient condition of taking place in the recent new equinox constellation, but most of the planets were located in the constellation of Aries. Hertha von Dechend writes about this in the general sense that a new age was valid as introduced if a triple Grand Conjunction of Jupiter and Saturn took place in a new spring equinox constellation (Santillana and Dechend, 1969). However, such a triple alignment in the new Easter vernal equinox constellation, Aquarius, never occurs in the whole third millennium! Between December 2655 CE and June 2656 CE, there is a triple conjunction in the western new spring constellation, Leo. It is followed 20 years later by a sensational close conjunction of all planets (including Uranus and Neptune), exactly on the vernal equinox in 2675, when the sun surely will be inside the boundaries of the constellation Aquarius, as defined in 1928. This event is so rare that it is not now calculable when or if a conjunction of all classical planets within a span of only 22° will ever be repeated on the NSE. As an anchor for a new way of calendrical timekeeping, this orientation for timekeeping seems to take account of the ancient view as well as modern Weltanschauung. Time reckoning - however it is carried on - until or from this moment increases redundancy and security of human timekeeping and creates a fixed point in time that is not loaded with religious symbolism and is politically neutral. The implementation of a new calendar will be a long political process entailing difficult discussions. The end of the Age of Pisces, since Dionysis Exiguus' incarnation count aimed to coincide at the millennium with a Greatest Year (conjunction of all naked-eye planets) based on the assumed constant of precession 66.6y/1°. The shifting of the vernal equinox from 21st March to 19th March due to the Gregorian leap year rule. The vernal equinox will take place on 19th March 21 times in the 21st century. The economic need for a calendar with uniform years. The function of Aquarius as the heliacal spring equinox constellation, which has displaced Pisces as the spring-announcing constellation. The recent orientation of the northern Earth axis towards Phoenice (a UMi), the top of the tail of the little bear, which has provided a bright polaris exactly on the celestial pole since about 5500 years after Thuban (a Draconis). The loss of worth and credibility in traditional religions and man's search for new values and orientation. For the beginning of a new worldwide calendar, we might focus on NSE in 673 years, the next remarkable planetary alignment (20-3-2675 CE). The countdown to that date could introduce the discussion and acceptance of a new way of timekeeping (Countdown to Equinoctial Planets, CEP). Starting calendrical discussion and changing our orientation toward the future is one of the heralds of a new age. He holds a knobby staff in his left hand, runs his right hand through his long, flowing beard and says with honorable sense the following words: "Don't be afraid! I will come out of my picture. Just look at this snake that winds and loops around my staff and remember it so you will recognize it again! I will change myself into it, but I will be larger and more impressive as it is usual for an celestial." All recent new years take place close to winter solstice, when in the morning of this day Ophiuchus stands there, where the rosy dawn indicates the rise of sun in eastern horizon. All recent calendrical new years are introduced by the snakebearer, therefore actually we have an age of the snakebearer due to the adjustment of the calendar. Otherwise if the new years would begin at NSE, Aquarius would announce the new year's day, as the Greek myth of Eos (rosy dawn) and Tithonos (young day) is expressing it, or as the Latin names of the months still show. Becker, Udo: Lexikon der Astrologie. Freiburg, 1981. Delporte, E.: Delimination Scientifique des Constellations, Tables et Cartes, IAU, Cambridge University Press, 1930. Gliese, W.: Precession tables. In Landolt-Börnstein VI, Vol.2c.No 8.1.1.6; Springer, 1982. Haupt, Hermann: Der Begin des Wassermannzeitalters, eine astronomische Frage. Anzeiger der Österreichischen Akademie der Wissenschaften, math.- naturw. Klasse 129, 75-78. 1992. Rosenberg, A.: Durchbruch zur Zukunft. München, 1985. Santillana, Giorgio de and Hertha von Dechend: Die Mühle des Hamlet. Ein Essay über Mythos und das Gerüst der Zeit. Wien, 1969. Van der Waerden, Bartel: Die Anfänge der Astronomie. Erwachende Wissenschaft. Bd. 2. Groningen, 1965.